A web-based real-time, multi-user, collaborative modeling environment for globally geographically distributed teams. Accelerate the design and delivery of solutions that your business stakeholders require. 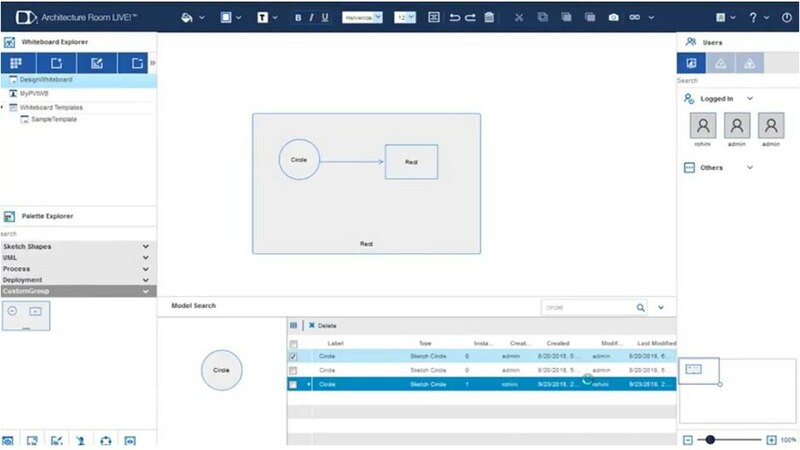 Simple design sessions on a shared whiteboard and the ability to collaborate globally in real-time makes IBM Architecture Room Live a powerful offering for your business. Architecture Room Live is as simple as a whiteboard, but it's more than just drawing: All your designs are based on a modeling backbone assuring consistency and integrity for all your architectural domains. Stakeholders are only a URL away from validating and verifying the completeness of a solution delivered to your customers. Work with your team in real time, no matter where they are located ensuring everyone is onboard. Easily organize your designs on different whiteboards linking them as your designs expand. Create consistent architectures without the complexity of formal modeling while maintaining strong design integrations.